Years after the initial release of Ruby on Rails, the chickens are coming home to roost. Suddenly, anyone could write a web application -- and it seems like everyone did. The web is now awash in Ruby applications that were easy to write but are now virtually impossible to change, extend, or grow. This book solves that problem by teaching developers real-world object oriented design techniques specifically focused on Ruby. Writing for more than 1,000,000 Ruby developers at all levels of experience, Sandi Metz shares knowledge and concrete solutions for creating more extensible, more maintainable applications - and for fixing many of the poorly designed applications they must now manage. 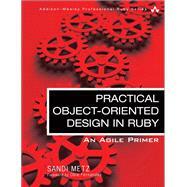 The first book to focus squarely on object-oriented Ruby application design, Practical Object Oriented Design in Rubywill guide developers to superior outcomes, even if their previous experience has been strictly limited to "procedural" techniques. Metz distills a lifetime of conversations about object-oriented design and many years of whiteboard drawings into a set of specific Ruby practices and patterns that lead to more manageable and pleasing code. Novice Ruby programmers will find specific "rules to live by"; intermediate Ruby programmers will find valuable principles they can flexibly interpret and apply; and advanced Ruby programmers will find a common language they can use to lead development and guide their colleagues. Sandi Metz has thirty years of experience working on projects that survived to grow and change. She now writes code every day as a software architect at Duke University, where her team solves real problems for customers who have large object-oriented applications that have been evolving for more than fifteen years. She has spoken at Ruby Nation and speaks regularly at the Gotham Ruby Users Conference.